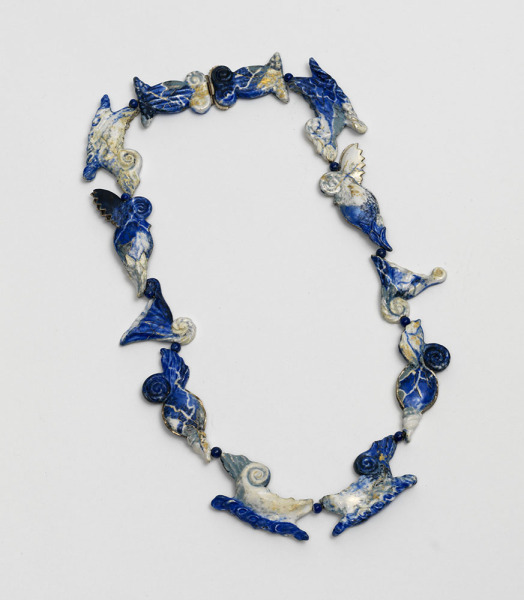 Necklace of various abstract enamelled silver pieces, painted blue, white and gold. Between each bead is a smaller round bead of lapis lazuli. The piece consist of cast silver beads on a nickel 'archer' chain with a 9ct white gold spring catch. The beads have been engraved and are hollow by being constructed of two halves soldered together. They have been enamelled in the technique known as encrusted enamelling and there are additions of 24ct gold wire and leaft in the enamel. The enamel has a matt (sic) finish. 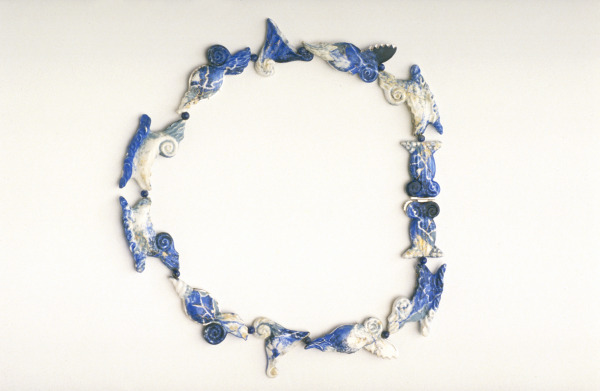 Enamelled Silver Necklace, Ros Conway, 1989-90, Crafts Council Collection: J199. Photo: Todd-White Art Photography. The necklace was one I had wanted to make for some time - the Crafts Council gave me that opportunity. I like every major new piece to be a technical challenge and this was no exception.